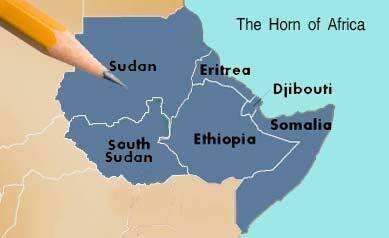 On October 20, 2003, we published “A Call To The Moderates of The Horn Of Africa”. Obviously, although the call was addressed to moderates from the whole Horn Of Africa in general, it was mainly addressing Ethiopians. We described our effort as taking a leap with the only safety net to be provided by moderate Ethiopians. We are very pleased by the responses that we have received todate, which confirms our belief. There is hope: there are enough voices of reason, although they may be, for now, crowded out by the noises of hate and violence. We have also received encouraging responses from Eritreans, which we are also including. We have the moral obligation to move beyond bemoaning our state of affairs and actually proposing solutions to the problems that face our people. Our problems are many and they have one thing in common: they cannot be solved unless we are able to come up with a formula for a lasting peace in our region. Wars–direct wars, proxy wars, war of words, have brought us nothing but devastation. We owe our people a breakthrough out of our current status, entrenched thoughts and practices. Those who are objecting dialogue or presenting preconditions for them come in two forms. There are those who have reached this conclusion independently: we invite them to follow their line of reasoning to its logical conclusion and honestly state if they are willing to subject their own countrymen to that prescription. As for the second group, those Eritreans who are espousing “No Dialogue” only because their sole function in life is to echo whatever Isaias says and will reverse their positions 180% the minute Isaias does so, we have an obligation to expose their moral cravenness so future Eritrean generations can understand who was the accomplice to a tyrannical system responsible for the hardships they had to endure. (YO) Well done. 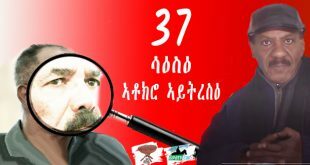 As an Ethiopian I was surprised, if not shocked, to read such great article from [an] Eritrean website. I understand many damages are done in both side and it is my wish if all misunderstanding and hatred are gone today. Well, we have a lot to go, the road to reach that peaceful world is twisted and hard, but it is a good start. If we could solve our problem one block at a time, the entire region will finally live under peace and prosperity. I praise you for being the first site to promote such a noble idea. (Ethiopian) thank god we can now see a fliker of truth from an eritrean .may be after all there might be light at the end of the tunnel. (AY) Dear Awate Team, Accept my sincere greetings! I have no words to express the inspiring feelings and satisfaction your fabulous article titled: “A Call To The Moderates of The Horn Of Africa” (dd. October 22, 2003) has delivered to my soul. It is full of wisdom. If you kindly permit me, I wish to translate the piece in the Amharic language and get it published in the Ethiopian private press for people who have no access to the internet. As an Ethiopian, who considers himself a nationalist, I am pleasantly surprised to read your call. The bottom line of your call is something that was missing for a while at least in such a public manner. (I had Eritrean friends I met in Graduate School who told me similar things but they will never dare to say that in public) This is a good begining, once we start on such a path – I see light at the end of the tunnel. There are many points I disagree with in your call, but on the bigger scheme of things we should focus on the real problem and the future. The challenge is how to build trust that will bridge the chasm. The more we communicate, the more we understand each other. The problem is we tend to speak our minds and the other’s mind. We will need to learn how to speak our position and let the other side speak theirs without us second guessing them. (A.G.) Dear Editor, I am an Ethiopian, who frequently reads your informative and balanced articles. I am very impressed with editorial entitled “A Call To The Moderates of The Horn Of Africa”. I agree with your call and I hope you will keep up the good work until and beyond “The voices of moderation reclaim back our land and bring relief to our people.”. 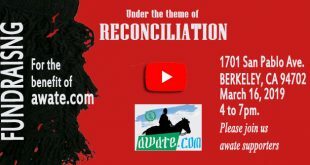 (Earth) Dear Awate Team, It was with great anticipation that I was waiting for this kind of forum to be set up so that we the concerned people of Eritrea and Ethiopia would get a chance to discuss our common problem. I am an Ethiopian who visited your web site on a daily basis and still do. Through the process, I learnt a lot about the politics of our region and the very inspiring type of writing. Saying that, I also visit the various regional web sites so that I come to a balanced conclusion about the whole issue. Although it doesn’t give me a full answer, I have always thought of the conditions which brought us to where we are now. I have always asked, how did it all start ?. Why is that it took little to fight one another and truggle to give dialogue a chance ? Why is that we crowded the web pages with articles when there is a cloud of war and stayed quite otherwise ? Is our problem home grown or fuelled by external forces ? Lots and lots of questions I could list I have kept them on a paper as they occur to my mind. But one thing clicked when I read your article. I was also asked the same question by an European friend of mine. He said to me, what do you think is the solution ?. He added, have you ever had a matured conversation to an Eritrean person at all? Well, now the forum is set up, I promise to contribute as much as possible. After all, I am lucky to have Eritrean friends Ethiopian friends who are Eritrians by origin. I have been discussing the above in great detail and it works in our small circle and it should work in any big forum provided it is based on a mutual understanding and respect. I would like to say thank you for organising this. Keep up the good work !!!. P.S. I prefer to use the pen-name “Earth” as it simbolises patience and carries all of us as one. (BK) Keep up the good job. Selam. I’m a regular visitor of Awate.com and I have to admit that I am often impressed and inspired by most of the articles posted on your website. Your advocacy for common sense and humanity to our minimum long predicaments offers desperately needed HOPE to the people of the Horn. I strongly believe that the article ‘A Call To The Moderates of The Horn Of Africa’ not only articulate the issues but also should be considered as a desiderata for all peace seeking and open minded people of this region. My heartiest congratulations and keep up the good work. (FH) Hi awateteam, I’m an Ethiopian and believe it or not an Amhara. 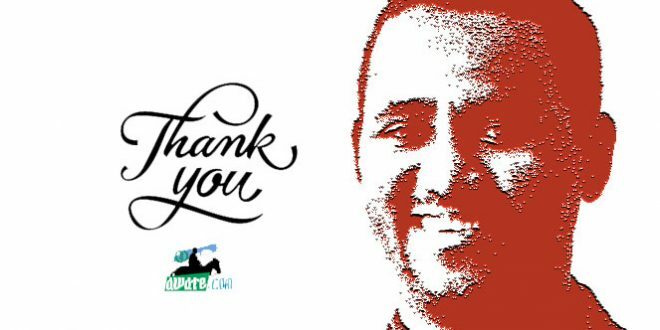 I was really touched by your editorial article ‘A Call To The Moderates of The Horn Of Africa’. I’m one of the few Ethiopians who believes, that the way forward is not extremism and hate, but the moderate way. Ethiopians and Eritreans have been mostly dominated by either Ethiopian or Eritrean extremists, who have made Eritrea a synonym of curse for us Ethiopians and vise versa. For almost half a century now, they were the dominant forces and have dragged the sub region into abyss. Now is the time for moderates and peace loving Ethiopians and Eritreans to stand and show the right path for the blind, who are blinded by hate. We should no more be a curse for each other, but a blessing! I encourage you to further promote the path of forgiveness and reconciliation, which the noble men of our history like Mandela followed. For the moment, we the moderate Ethiopians and Eritreans may be a minority, but I’m sure that the time will come, when we may help the blind to show them the way out of this half a century old vicious circle of hate and destruction. God bless Ethiopia and Eritrea! 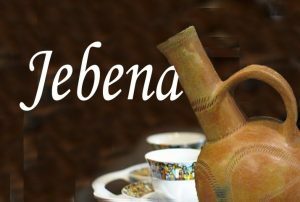 (TK) To the Awate Team and All: Your October 22 Editorial under the above cited heading is indeed a daring and refreshing departure from the ordinary political exchanges that have for far too long gained wide currency among the elites in Eritrean and Ethiopia. As an Ethiopian saddened by the suffering of the peoples at both sides of the divide, I find such a call for self-examination one timely and long-awaited step in the right direction. Dare to take similar further steps and I am reasonably certain that you would find a number of reliable Ethiopian partners joining you sooner than later. (G) what a noble idea! God Bless You! (T) Dear Awateteam, I will give an A – for the above wonderful article. 🙂 As always your analysis is sober and food for thought. I am touched that you stated the obvious of many Eritreans love for Ethiopia. As an Ethiopian, I admit of feeling the same love towards Eritrea. I looked up to Eritrean work ethic, cleanliness and business sense. I suppose that’s your 60 years colonial experience different from the rest of us. It gave you an advantage to be on top of the then politics, economics & modern technology. On top of that I grew up admiring Zerai Deres and the rest of our heroes. BTW, at one time I even considered SHAEBIA to be the Angafaw (oldest) Ethiopian liberation movement. Eritrea had a “choice” but the rest of us are only left with the independence of the thousands of years to be proud of and we bring that up particularly when we feel threatened by anyone. We call you Ye-Talian-Baria , etc., every time our self esteem is low or when you try to show off and act like the colonialists you’re not. There is no doubt we shall continue to do that to anybody who dare put us down for our underdevelopment because we know that’s a pride no one can take away from us. However our love to you as just another fellow family member was never put to question. Looking back, I think we may have been insensitive to your plights under colonialism. Your fight for self determination was taken by many of us (save TPLF) as just another Ethiopian liberation struggle & never separate. How could we understand it any other way when your then position in the society as the higher class compared to others was giving us a “false” signal? Who in the right mind would think a ballast or a rich merchant suffers from such a pain? As late as 1985 when I went back to Addis for a visit after many years in the US. I observed the best formerly Italian/foreign owned restaurants, car shops and many private enterprises were run by Ethiopians possibly the majority and the ones I enjoyed the most were run by those who came from Eritrea. I was proud of those folks and patronized them with enthusiasm. They were my own hard working Ethiopians period. To my surprise, come 91″ boom! Eritrea was separated. I felt cut into two. If an Ethiopian cries for Assab today it’s because he/she still feels the hurt & pain of Eritrea’s rejection. Save Woyane, you hurt our feelings bad and we’re too proud to ask you to come back anymore as economic or any other partners from then on. You weren’t fair with us. If you at least left us Assab without strings attached for access to the sea as a courtesy to your old mama to use indefinitely, it would have left a soft spot in every Ethiopian. We would have given you all the time you need to work on yourselves. Until you’re ready to come back we would have followed your wish to economically Integrate in what ever way your heart desires. Be that as it may, I am still trying to understand and forcing myself to adjust to your secession. I honestly have a hard time understanding why “Majority” Eritreans determined (as Awate put it) to secede from their Ethiopia. I think & wish you’re wrong on that and thus I gave you an A-. Keep up the good work. (YW) greetings. Selam Awate.com. This is the most insightful commentary I have seen so far from you. 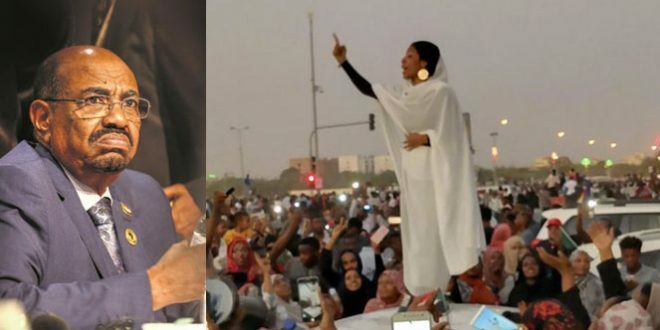 You spilled out your guts so that hundredth of thousands of our compatriots in the region and specifically Eritreans and Ethiopians to pose for a second and ask what are we doing? and which way out of the quagmire that our peoples find themselves? I thank you for your true self. 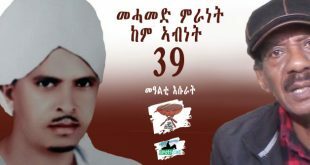 (MF) Selamat Ahwat, It is with pleasure beyond measure that I am forwarding you this post just to express my gratitude and appreciation for the great job that you are doing as genuine national democrats to liberate our people from the the fascist regime in Asmara. 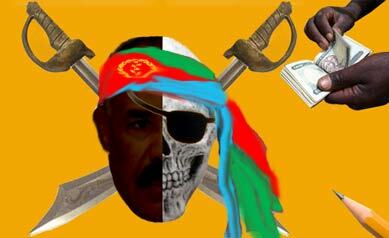 I do appreciate most of your analysis related to the current situation in Eritrea. 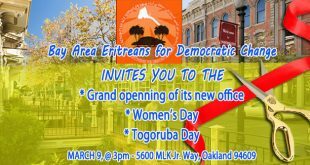 Your call for the Eritrean and Ethiopian democrats for dialogue is a visionary vision and stand. Bravo. (S) 100 %Very good idea. Hello. I am Eritrean born in Ethiopia, “You get the point for peace” go a head, please send it to Ethiopian web sites even to free press in Addis. Thanks for this noble idea. (TZ) Thank you Awate team, you make me proud to be Eritrean. I was not sure about your call for dialog on you last message because I though it was an idealistic response for what I consider a very real and dangerous problem facing our country. But now I can see your visions clearly with this message and I like where you are heading. Those of us who do not want to see another destruction in our region must be heard speaking out now. It is usually the warmongers who get louder during tough times but now you have started a very noble cause, may God\Allah be with you. We had also shared with you a copy of a letter from an Isaias Accomplice who showered us with the now familiar language of Isaias and Isaias Accomplices, the wedini-skunis language. 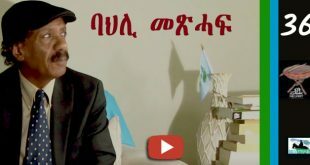 The writer was Ms. Hidaat Ephrem, a person who defines Eritreanness by one’s ability to memorize and repeat everything said by Isaias. We do not have the slightest doubt that if her hero called for dialogue tomorrow she would enthusiastically praise it as very wise and farsighted. Why do you think you are so powerful [?] In the last two years you thought that you could bring some sort of magic by being a go for lies between the Eritrean opposition camps and main stream. Perhaps you have not realized it yet, but it was a total failure – you neither have power and ability to do anything except to bring wider gaps, just look at what your role was in the ELF-RC. Now, you want to bring Ethiopians to the peace table in a fashion only your demented perception can imagine. Give it up man! You don’t even command a simple respect from anyone, let alone Eritreans anymore. Awate.com is known for its spinning of lies and torching people’s feeling to create distance and havoc. 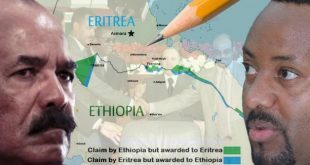 Eritrea wants what is truly hers, and she has achieved it legally. 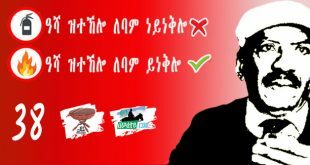 If you can not stand up for that, then put a sock in your filthy mouth and stop preaching how we love Ethiopian things.